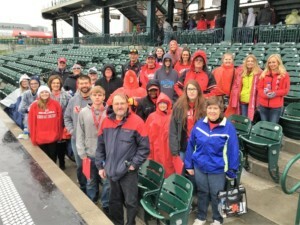 Braving the wet, cold day, almost 40 mentors and mentees from Freeman TeamMates attended the Nebraska Spring Game. The day began with the TeamMates graduation ceremony at Haymarket Park. Freeman had three seniors out of over 100 TeamMates seniors participating in the ceremony. Seniors are Kaitlyn, Travis, and Lane. Freeman senior Lane did an excellent job as one of the speakers. Once the ceremony was finished, we joined the many other chapters present and took the walk to Memorial Stadium where we enjoyed the atmosphere of the spring game. We would like to thank Freeman Public Schools for providing transportation, Gary Kroese for driving the bus, and the TeamMates Board of Directors for providing the game tickets and the snacks for the ride home.